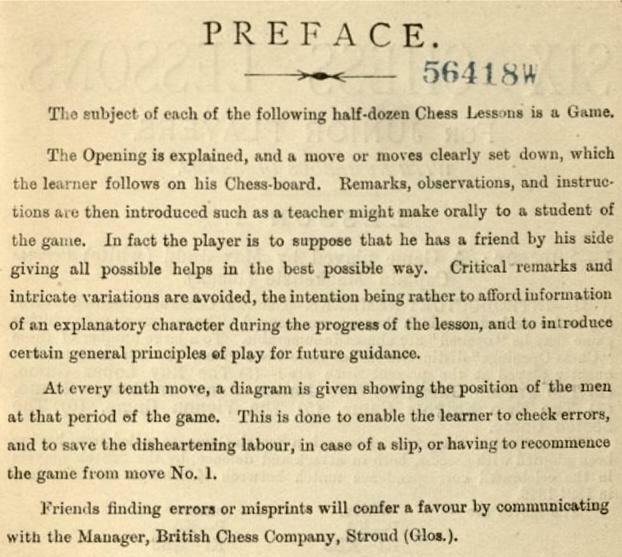 Lombardy also quoted the ‘trim’ wording on page 134 of Modern Chess Opening Traps (New York, 1972), adding ‘Tinsley, circa 1880’. 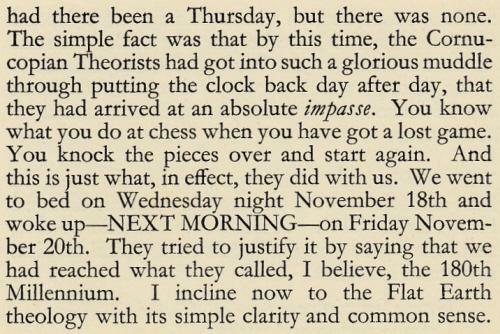 On what basis? 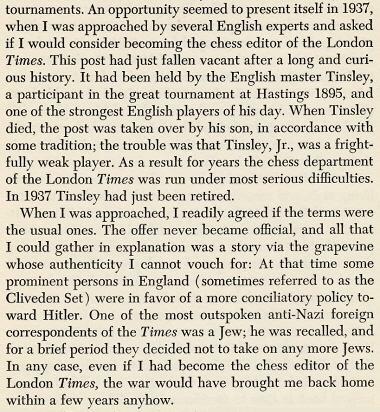 Page 172 of Chess: Man vs Machine by Bradley Ewart (London, 1980) has a detail of Samuel Tinsley from a painting by Anthony Rosenbaum owned by the National Portrait Gallery, London. 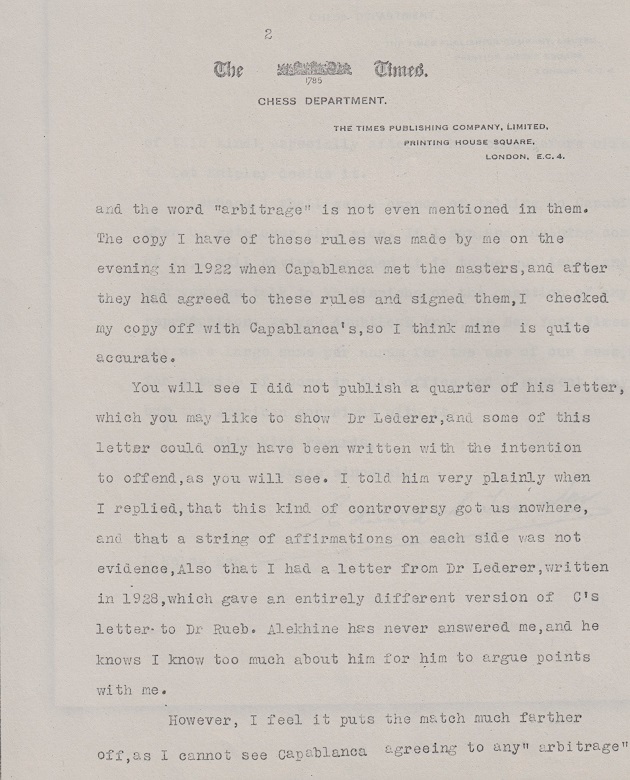 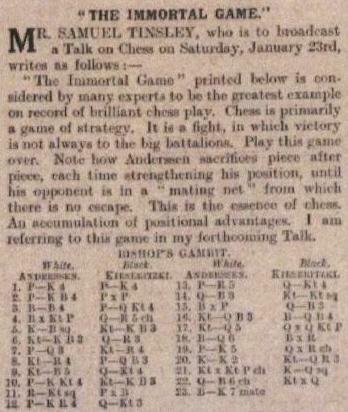 Tinsley’s game against Mephisto, given by Ewart on pages 171-173, was annotated by Steinitz in the Field, 20 April 1878. 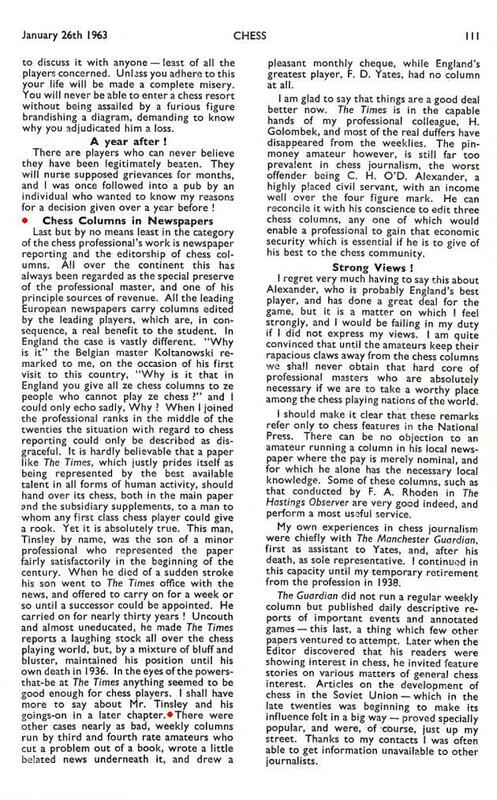 Page 195 of Arpad E. Elo’s The Rating of Chessplayers Past & Present (London, 1978) lists Edward S. Tinsley 1869-1937 and gives him a best five-year average rating of 2400. 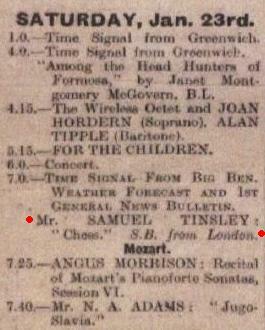 We cannot believe this and feel there must be a mix-up by Elo over the father and son. 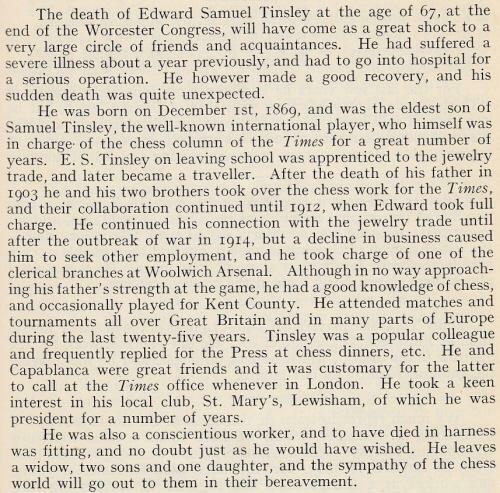 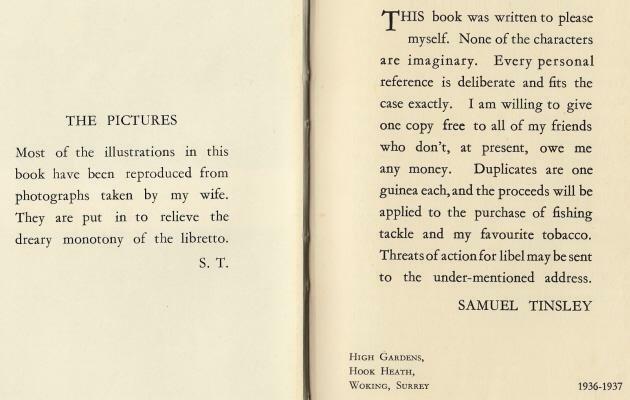 In 1937 Edward Samuel Tinsley had not ‘just been retired’. 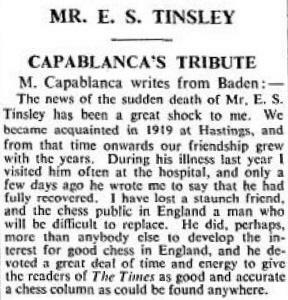 He died. 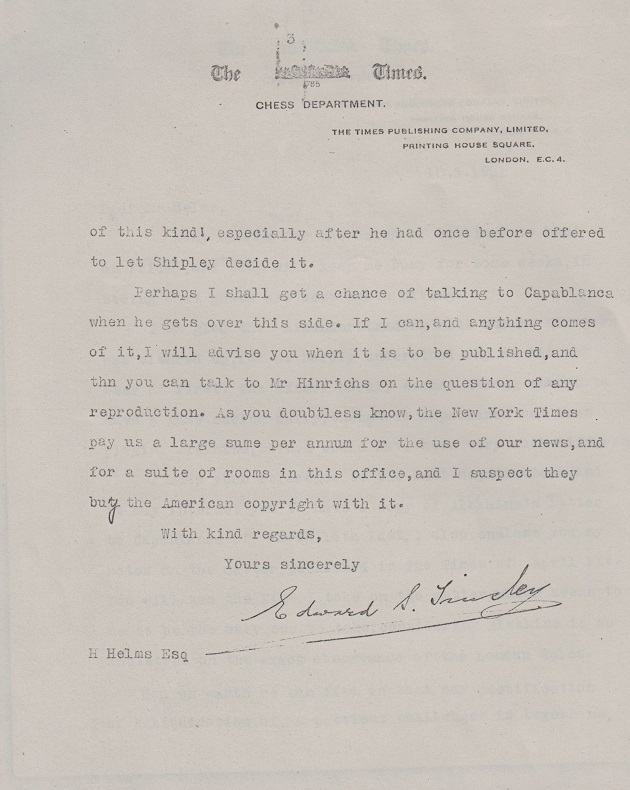 To what is Tinsley referring? 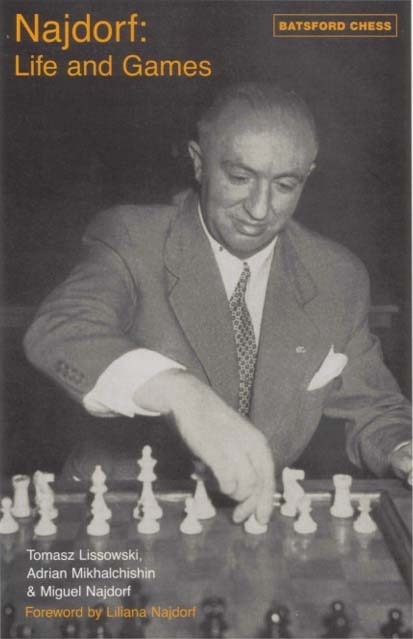 The game was misdated ‘1918’ in three editions of Capablanca’s games compiled by Rogelio Caparrós (Yorklyn 1991, Barcelona, 1993 and Dallas, 1994). 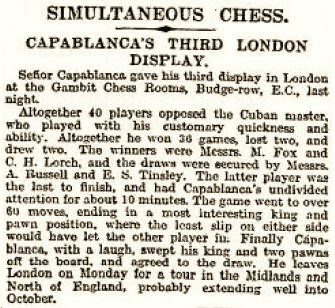 The score was also given on pages 245-247 of Capablanca in the United Kingdom (1911-1920) by V. Fiala (Olomouc, 2006), from the Times Weekly Edition, 10 October 1919. 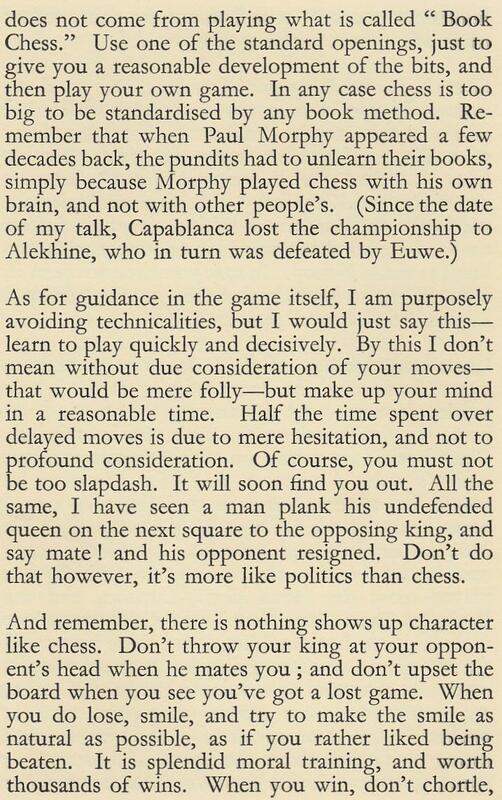 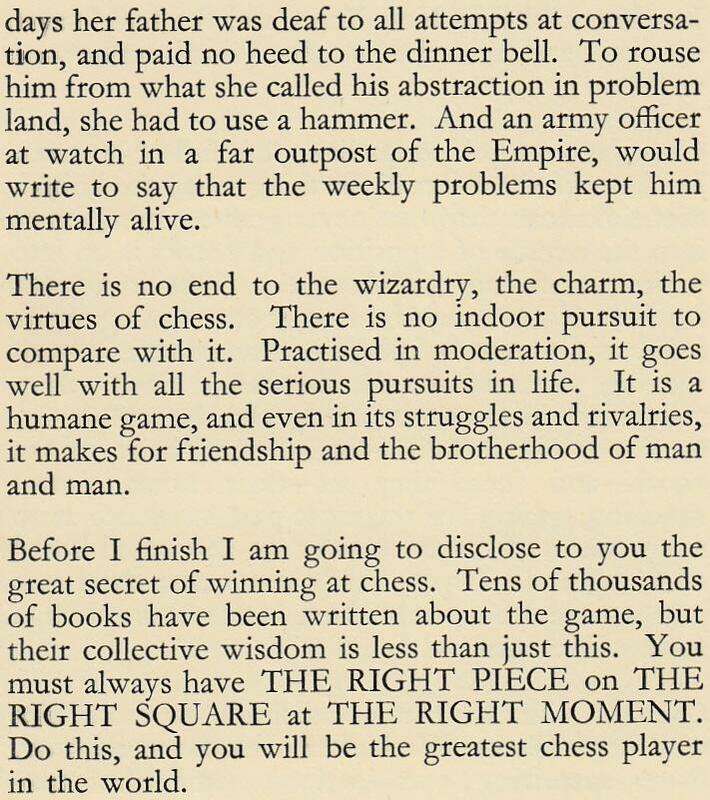 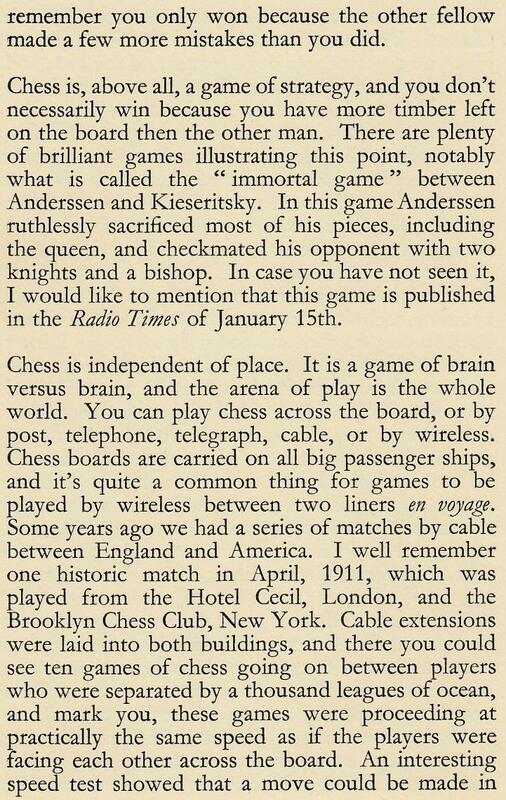 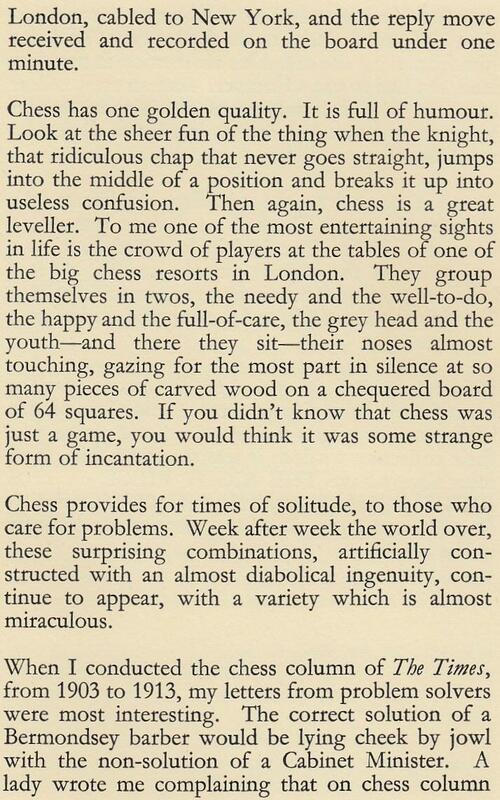 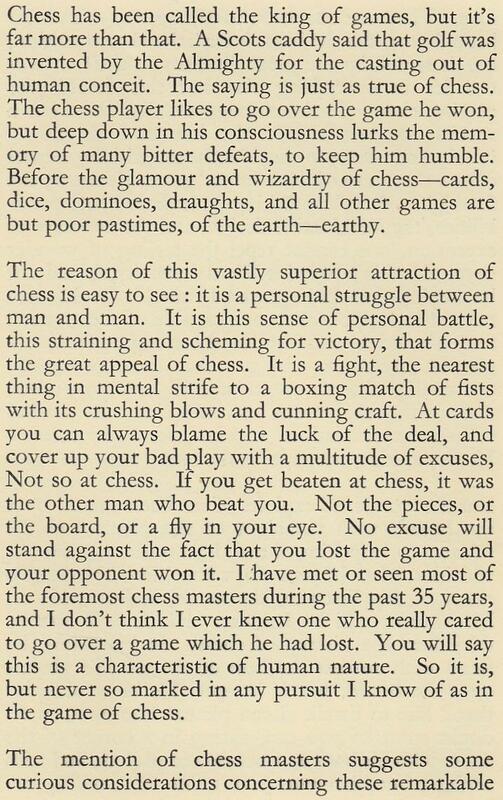 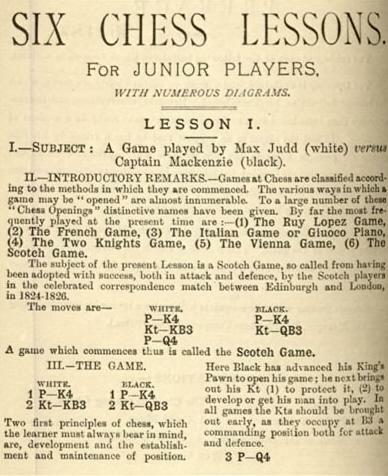 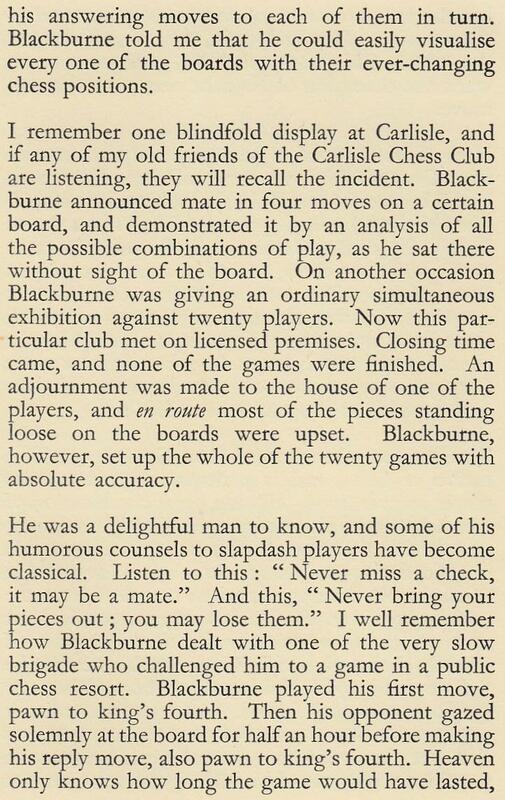 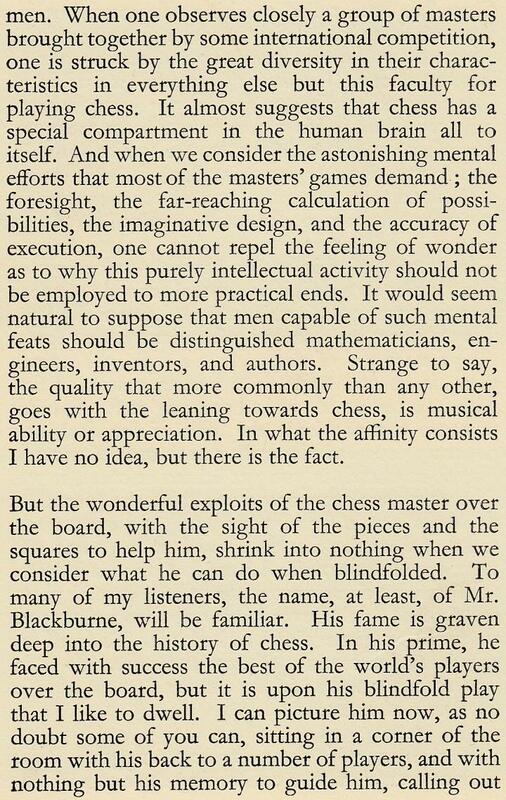 Chess and Radio quotes, from two January 1926 issues of the Chess Budget, brief references to a British Broadcasting Company talk on chess by one of Edward Samuel Tinsley’s brothers, Samuel. 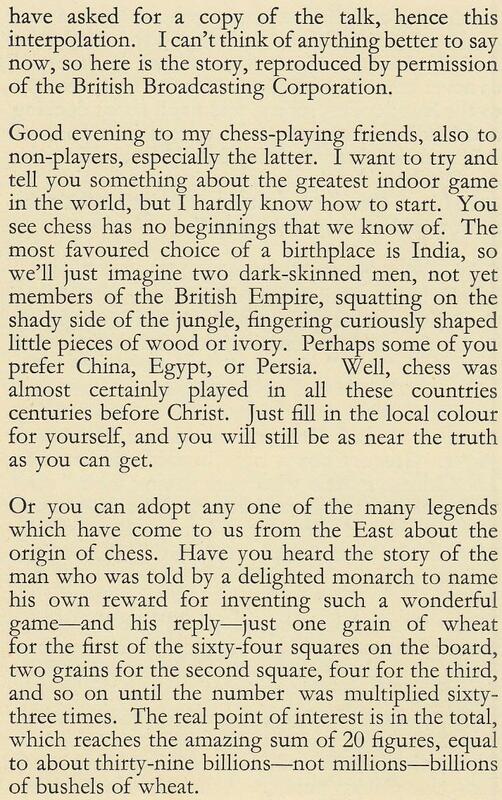 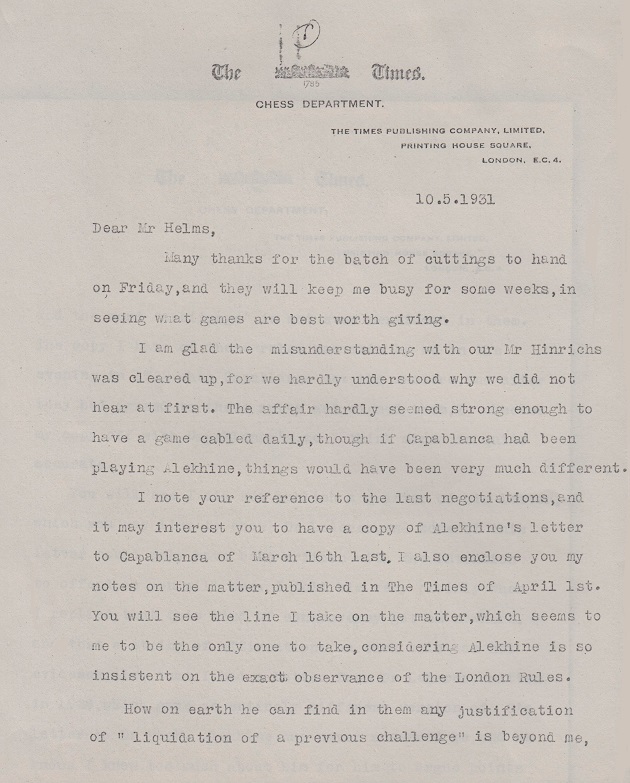 We have now found a transcript, in an improbable place: the chapter entitled ‘The Indian Ocean’ in his travel book Across the World (London, 1937). 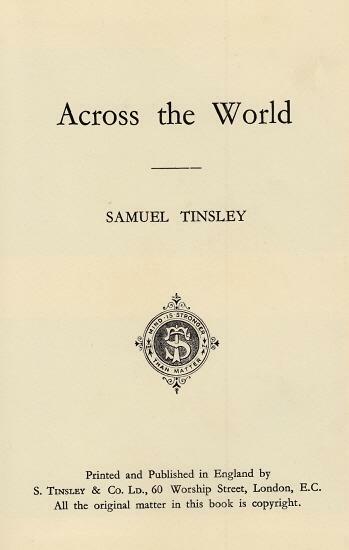 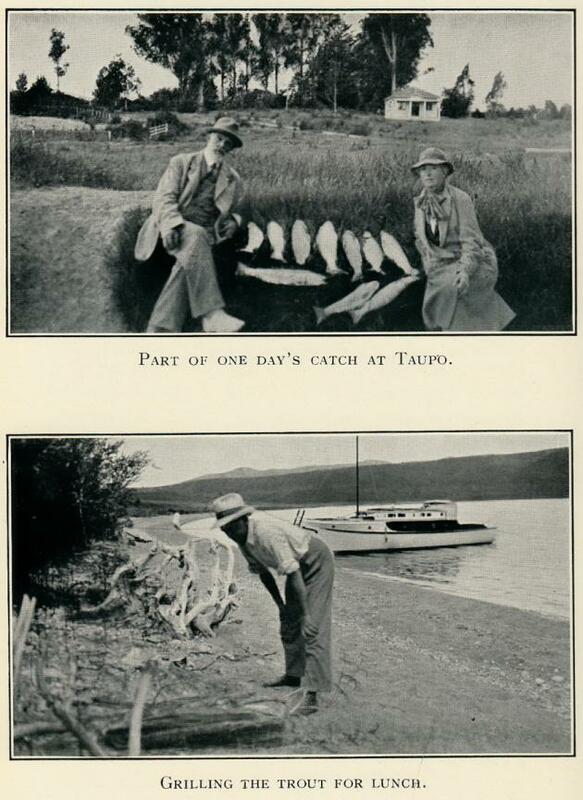 Source: unnumbered page in the chapter ‘The Pacific Ocean’ in Across the World by Samuel Tinsley (London, 1937), the book discussed in C.N. 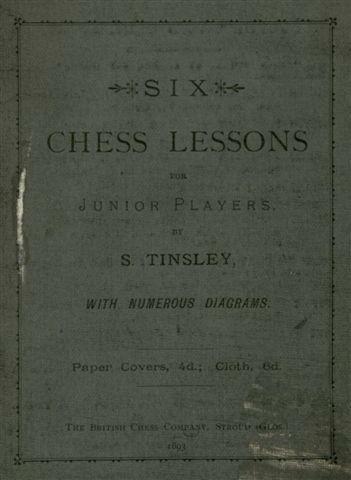 8725. 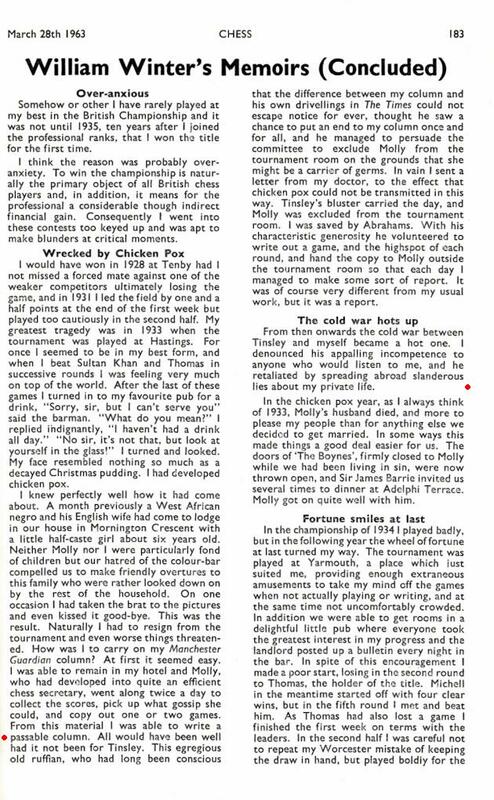 Permission to show the above material has been received from Immediate Media Company London Limited, the publishers of the Radio Times. 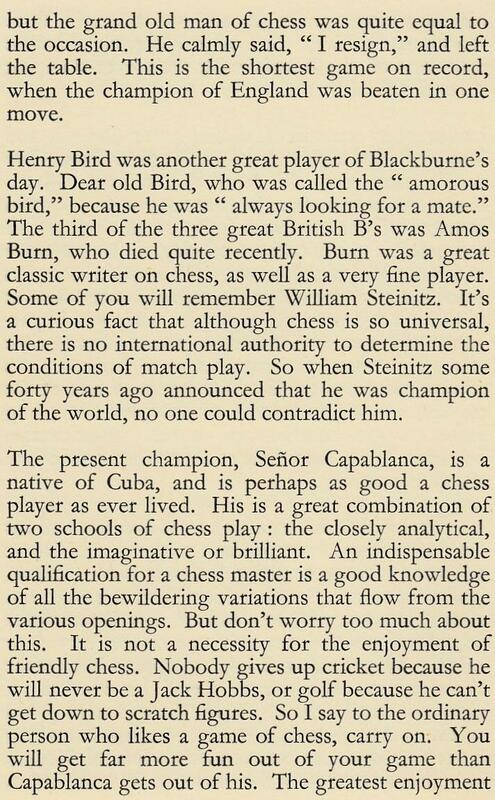 Can it be discovered when he died? 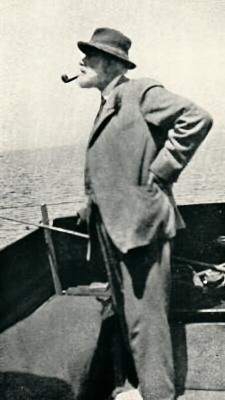 Most picturesque figure aboard when the Orcades sailed from Station Pier this week was Mr Samuel Tinsley, of Hook Heath, Woking, Surrey, former London journalist and retired publisher and printer. 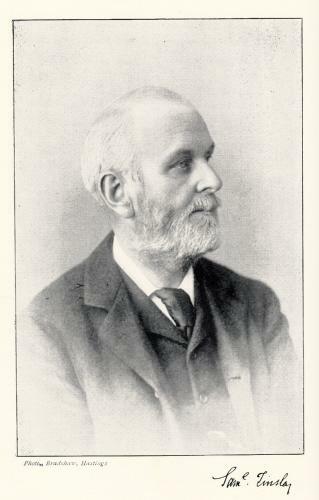 Smiling blue eyes twinkled above a Bernard Shaw beard, and a tie and kilt of the McLaren tartan, while a leather sporran matched his Scotch brogues. 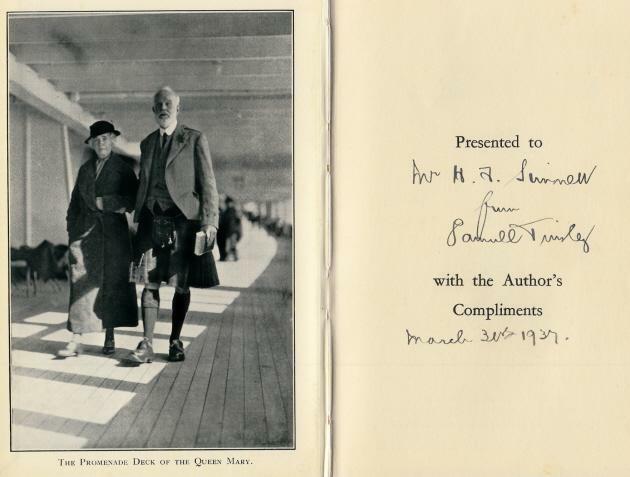 Add to this a fistful of multi-coloured streamers and you have a picture of a grand old man who thinks that Australia is a wonderful country. 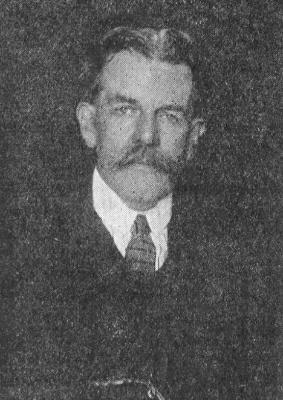 His age at the time of death is given as 73 in the General Register Office’s index to deaths (June 1945 quarter, Surrey N.W., 2a, 425).